I always wanted a pig. I have fond memories of pressing my small (and not terribly clean) nose against the glass cases at Notte’s Bon Ton Pastry and Confectionary, a wonderful old-fashioned cake shop, which used to be on Granville Street in Vancouver, before it moved to the Kitsilano neighbourhood where it now resides. 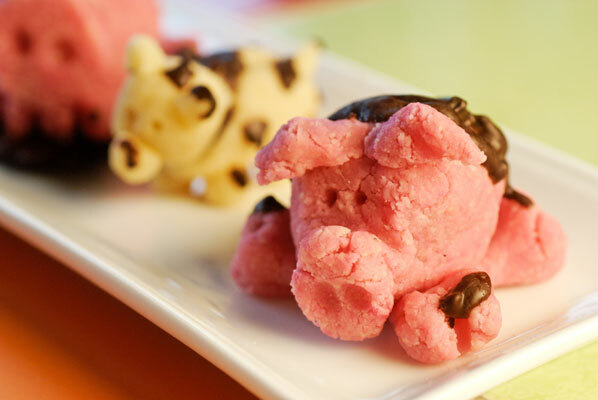 The Bon Ton, as it is known is Vancouver, had the most wonderful, colourful menagerie of marzipan animals including a seal balancing a ball on the end of its nose, a grey elephant, and my favourite: a bright pink pig with chocolate nostrils. I loved the squishy buttery cakes at the Bon Ton, but I wanted the marzipan pig to play with, not to eat. I didn’t actually like the taste – too rich for my small palate, I suppose – but my sister loved it. She wasn’t big on the pigs, though. Her aesthetic ran more to the elegant fruits. So, I never actually got a pig – until now. 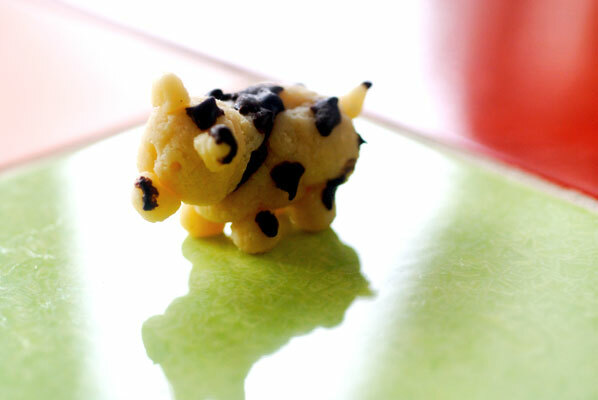 Here is a link to some other truly talented marzipan artists. While in rehearsal for a show at the Arts Club, this past Christmas, a dear fellow actor, who knows my passion for all things chocolate, brought me in an i-Pod sized chocolate bar from Mink Chocolates. 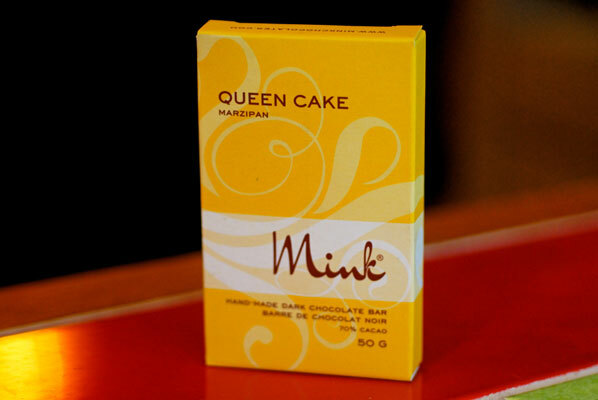 I loved it, and after devouring the whole thing backstage (I did actually share it … a bit), returned to Mink, to explore the full range of their flavours. Among the ones I brought home was the Queen Cake. I actually bought it for my son, a big marzipan fan, but he found it not to his liking. So, I ate it. Mmm – dark chocolate, and just enough marzipan to squish against the roof of your mouth, without that gritty feeling. Perhaps I was developing a taste for the flavour of marzipan, juste un soupcon. A couple of weeks later, as this was a Christmas show, and the whole cast and crew delighted in making glorious homemade treats, I had the good fortune to sample the most delicious chocolate covered marzipan I have ever tasted, from a cherished family recipe, belonging to our Stage Manager. It made me a convert. It is definitely the dark chocolate/marzipan combination which appeals to me, I have decided. Mix it all together by hand with a pastry cutter. Then put in a large ziploc, put something heavy on it and let it sit overnight. Roll into balls and cover with chocolate. 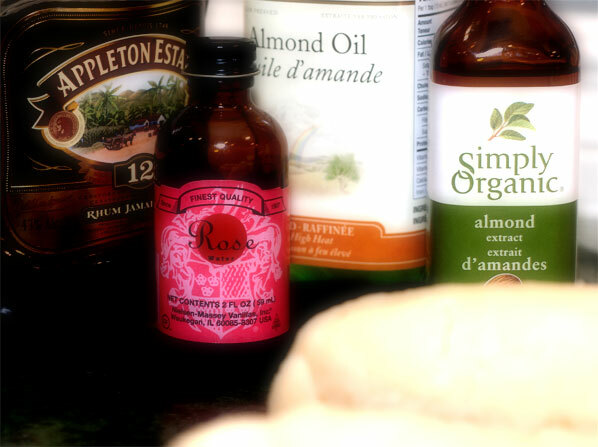 If the almonds seem a bit dry I add more almond oil. Same with the bitter almond extract, I sometimes used two of the little bottles. 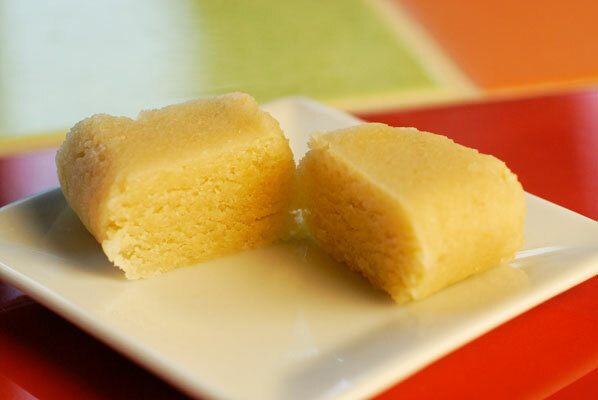 In my zeal to get started, I overlook the fact that the almonds I have are unblanched, natural almonds, perfect for making a lovely variation on gianduja, and wrong for making marzipan. I ground them up anyway, thinking “It can’t make so much difference”. By this time, I already had my sous chef (our younger, marzipan-loving son) measuring out the liquids, and doing the conversions on the bitter almond extract– another substitution I had to make, as I could not find Dr. Oetker’s. It is very concentrated, so for this recipe, I substituted 2 tsp of Simply Organic almond extract, for the ½ teaspoon ampoule of Dr. Oetkers. The rose water smelled divine, but when it was added in, it was absolutely overpowering. Perhaps ours was concentrated, but nothing indicated that on the label. While letting it sit under a heavy marble slab for the required 24 hours, it occurs to me that the Ecole Chocolat has been good for my impatient nature in a lot of ways – I have been forced to slow down and wait for things to happen in their own time in so many of the technique lessons – woe betide if I try to rush making, for instance, a ganache. There. Chocolate making as part of the Slow Food movement. We lift the slab from the mass, open the zip-loc bag … and are hit with the scent of rose water … and the taste of it. Heartbreaking. It is just too floral. It also will not properly hold together. Ah. That would be the natural, unblanched almonds. The lesson learned yet again – do not mess with a venerable Grandmother’s recipe, until you know how to make it properly the first time. The bag goes into the freezer, until I can figure out what to do with it, as I am determined not to throw away a pound of nuts. It has made over a pound of marzipan, plenty to spare to press into molded dark chocolate shells. I feel far more controlled than when filling liquid centres, as I roll up pieces and squash them lightly into the molds. 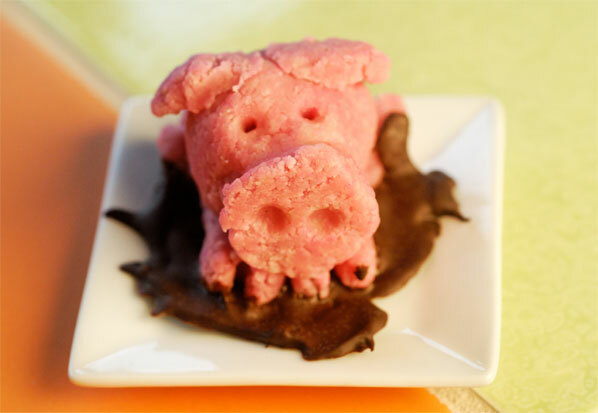 The next evening, after dinner and homework, using our tools for clay sculpting, we create our version of the marzipan pig. Four in all, they all have slightly different personalities, and I have to admit, my son’s looks quite a bit more realistic (from a porcine perspective). I will, of course, not eat these. They are, after all, merely painted and dotted with chocolate (for dirt), and I require the more generous balance of the glorious dark stuff. I will exercise my new found patience and wait for the chocolates in the molds. And I’ll save these little pieces of crude food art: the fulfillment of a childhood wish.